The St. Louis Blues and their fans alike are anxiously awaiting opening night of the 2014-15 NHL season, and the excitement is truly rising around the city. Thursday night cannot come soon enough in the Gateway to the West, but in the meantime let’s reflect on what the Blues’ preseason has taught us about this year’s campaign before it begins. Here’s a look at 5 of the biggest stories from the preseason that will translate into big things for the team during the regular one and beyond (IN NO PARTICULAR ORDER). Though this headline is not one many St. Louis faithfuls will find surprising, it is still big news coming out of the organization through this year’s preseason. Vladimir Tarasenko has been on an impressive developmental track since he first laced up his skates back in Russia (basically). His play-making ability has shown throughout his rookie years, and his scoring ability is one of the reasons the Blues drafted him 16th overall in the 2010 NHL Entry Draft. However, what is especially exciting about the Blues young sniper is that he came into training camp this season as one of the strongest on the team (again), and even finished tied for 2nd on the bench press fitness test (he put up 300 over his 219 pound frame). His unrelenting work ethic and endearing demeanor off the ice keep him focused while on it, which will pay dividends for the team this season. Look for the young Russian star to put up 60+ points this year in true highlight-reel fashion, and in every situation imaginable. With so much depth around him he is sure to continue his mold into a scorer similar to Steven Stamkos. Though this may be the largest question mark the Blues will face this season (and did face this preseason), overall it will be as it has been in the past. A shared net with a 1a and 1b goalie that combine to shut down all opposition night in and night out. Fans may not see the low stats they are used to out of this year’s tandem of Brian Elliott and Jake Allen, but with the added firepower and promises of quick transitional play and creative play-making in the offensive zone, the Blues should fair just fine in the standings and playoffs with this pair. Brian Elliott brings a sense of calm to the back end, and will definitely bail the defense out of any jams they get in to through trying to maximize those quick transitions. He will also be able to handle a slight majority of the workload to allow Allen the time to get used to being a regular NHL player. This will help Jake the Snake settle in and learn from his mentor, which will help both of them stop more pucks throughout the season. Jake Allen will be the constant pressure Brian Elliott has proven he needs to stay sharp year after year, and Allen’s healthy competition should bring the entire team’s compete level up a notch. This means the boys of St. Louis could indeed find themselves in another Jennings Trophy situation by years’ end. Though the tandem will fall into a few valleys throughout the long season, look for them to always return to excellent form in a short period of time. The first pick for the St. Louis Blues at the 2014 NHL Entry Draft did not disappoint at his first pro training camp or in his preseason game play, and almost cracked the roster on try number 1. Though it’s no surprise to see him return to the Guelph Storm of the OHL (Ontario Hockey League) this season, what was surprising is how well he kept up with NHL level competition given his small(er) stature. He proved this camp that he has the skill set to become a Marty St. Louis type of player in his future, and also showed that his play-making abilities rival anyone in the league…at just under 19 years old. His amazing hands are only outdone by his foot speed and hockey IQ, which prove he is a true star on the rise. His knack for finding the net in every situation (and every way) will be welcomed alongside current Blues stars as early as next season. As long as he can pack on the mass while staying shifty and speedy, he’ll be a cornerstone of the Blues future for years to come. One of the biggest surprises this preseason was the emergence of rookie blue-liner Petteri Lindbohm. Lindbohm had a relatively quiet prospects camp, but exploded onto the scene at this year’s training camp with great skilled plays into the offensive zone, shots that were accurate through traffic, and the ability to cover mistakes and hustle back to play true defense. He was incredibly hard to knock off the puck, and was great at getting his stick in passing lanes to makes things difficult for the opposition. 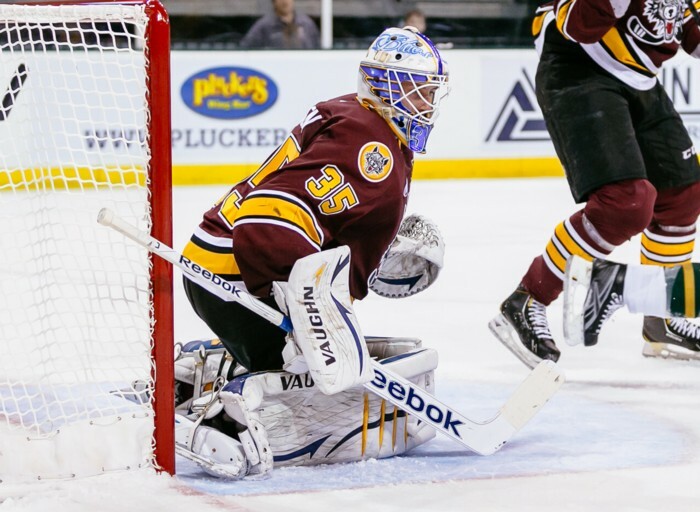 Though he did struggle with his positioning at times, the 6 foot 3 inch Finn is going to become a true beast with the Wolves this season, and should crack the Blues full time roster as early as next year. 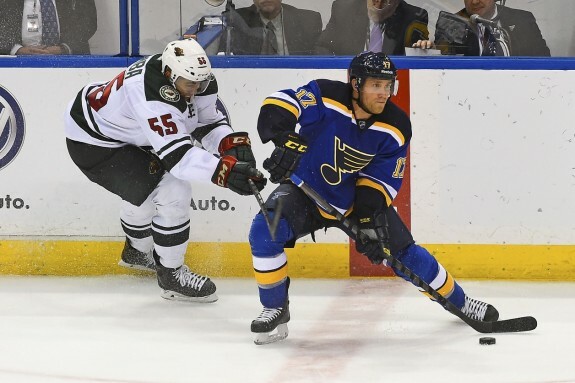 He does need to follow Fabbri’s lead and pack on a little mass to get him truly ready for the NHL game (he’s currently listed as 6 foot 3 inches and 198 pounds), but he should fit in nicely with the Blues new systems, and as the preseason stats showed us, he should contribute on a regular basis once he’s ready to go. It’s no secret that the team is trying to erase their recent playoff woes, and this season may very well be coach Ken Hitchcock’s final opportunity to do so. With every player fighting for a spot through the preseason and into the regular one it’s time to put up or shut up. Luckily, the entire organization seems supremely focused on making a true statement across the league for a hopeful 104 games, not just 82 of them (that’s 82 regular season games plus around 22 playoff ones). The team’s leadership group is entering the prime of their careers, and should provide newcomers and younger players with the advise they need to stay focused, and make the right plays at the right time to capitalize on as many opportunities as possible. The previous years’ playoff woes may be the exact motivation this year’s team needs to finally be seen as legitimate cup contenders, and it seems as if they are ready for the challenge that lies ahead. Whether it be through brute force, creative scoring, timely defense and goaltending, or a combination of all 3 the Blues depth and team chemistry has them looking to make a true statement throughout this year, and in to the future. If the team can manage to stay healthy for most of the year (and going into the playoffs) they will definitely turn some heads around the league which makes every fan very anxious for Thursday night to get underway.